When, Where, and What is West Indian Labor Day Parade in Brooklyn? Brooklyn's an epicenter of Caribbean-American life. You can eat at mom-and-pop West Indian restaurants. Or, shop at stores selling foods and items from the Caribbean. You can listen to Afro-Carib music at clubs and concerts. Over 600,000 New Yorkers are of West Indian heritage, according to census figures, and Brooklyn boasts many neighborhoods with large Caribbean populations. So, if you want to participate in a Caribbean style carnival, or go to a celebration of West Indian culture, where to go? As you countdown until the festivities during the week before Labor Day, culminating with the famed parade on Labor Day, you can fill up your summer, enjoying these fun activities. From dining on authentic Caribbean cuisine to museum exhibits. Here's the scoop on the parade and other activities you can enjoy this summer. The West Indian Day American Parade, a colorful West Indian Carnival that kicks off the end of summer and beginning of September, is held on Labor Day every year (in 2018, that's September 3rd). It's an unbelievable event, with raucous bands, lively dancing, costumes that range from scant to incredibly elaborate feather "Indian" outfits. You can hear traditional mas bands, steel drum music. Watch floats. Get in the swing. 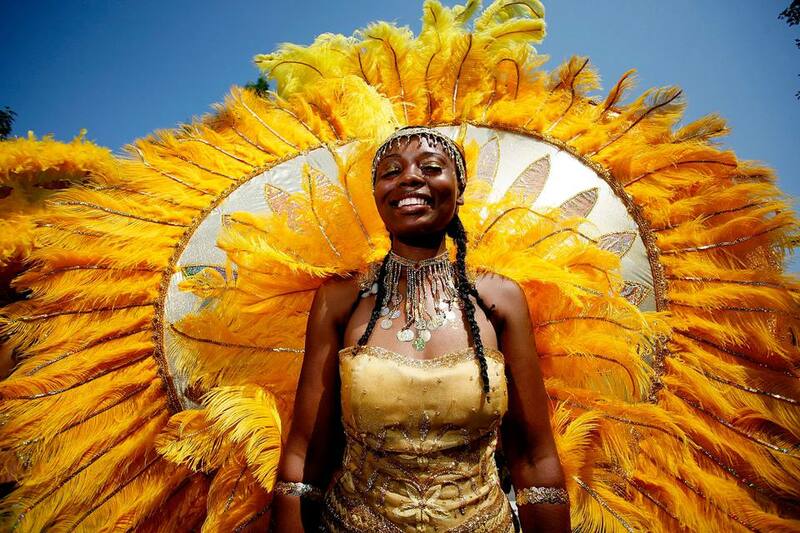 One of the Big Apple's biggest, and most popular parades, this celebration of West Indian culture draws spectators from all over. The Caribbean American Labor Day Parade (also sometimes called the West Indian or Caribbean Labor Day Parade) is a major New York City event. Preceded by days of pre-events, including a viewing of the steel drums usually held at the Brooklyn Museum, the actual parade itself is held on Labor Day Monday. It takes place on Eastern Parkway in Brooklyn. This year the parade celebrates it's 51st year, come join them in the festivities. This colorful parade, complete with costumed marchers wearing extravagant feathered headdresses, floats, marching bands, steel band music, vendors selling roti and other local street food, live performers up and down Eastern Parkway, and more, has drawn up to two million visitors. The parade starts at day break and lasts hours. Check out the parade route, so you won't miss this unique and lively parade, that is apart of NYC's history and is a must-see on Labor Day. WIADCA, the same folks that run the West Indian Parade, will host various events including family-friendly free steelpan workshops from May 5th through June 23rd. If you're headed to Brooklyn for the parade this year, spend some extra time in the area experiencing some other aspects of Caribbean culture in the borough. See some Caribbean Art at the Valentine Museum of Art: If you thought Coney Island only housed an amusement park and a beach, think again. This stretch of Brooklyn is also home to a new museum. The Valentine Museum of Art on Flatbush Avenue, housed in the Philip Howard Apartments has exhibits from notable Caribbean artists including Hugh Bell. The museum is open Wednesday – Sunday, 12–6 pm. Grab an authentic Caribbean Meal: Looking for tasty roti and jerk chicken? Then head to The Islands located near the Brooklyn Museum. The Islands is a Jamaican restaurant that serves up some of the most flavorful Caribbean food in the city. Folks make the pilgrimage to this beloved restaurant on Washington Street. If you are a vegetarian, Islands has many veggie options. Islands is just blocks from the West Indian day parade route. Other local favorite Caribbean restaurants include Sugarcane in Park Slope, Gloria's Caribbean Cuisine in Crown Heights, and Peppa's Jerk Chicken on Flatbush Avenue.